My niece and nephews all requested different treats one Sunday. I made my nephew Jacob his favorite Gingerbread Snickerdoodles and I made my niece Sydni some cupcakes. My nephew Caleb asked for chocolate chip cookies but I was foiled by a lack of baking soda. Finally I made them for him, three days later – and yes he kept track of that fact. I tried this recipe posted at AllRecipes but made adjustments to it based off reviewers feedback from the site. With the addition of the vanilla pudding, they came out very fluffy and a bit too soft for our tastes. 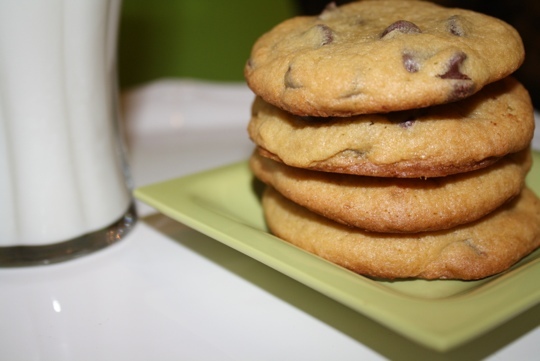 So I’m still on the hunt for that amazing chocolate chip cookie recipe. In a separate bowl, beat butter, sugars and vanilla extract until creamy. Add eggs one at a time and mix well. Slowly mix in flour and vanilla pudding. Using a wooden spoon, mix in chocolate chips. Using an ice cream scoop, drop dough onto ungreased baking sheets. Bake for 9-11 minutes or until golden brown. Cool on baking sheets for 2 minutes. Remove to wire racks to cool completely.